May buy 1 for yourself and 5 additional as gifts. May use 2 per visit. Must sign waiver. Valid only for option purchased. Ages 0-1 are free. Expires 4 months after purchase. See the terms that apply to all deals. The Bounce House offers inflatable attractions for all ages. The Bungee Run pits two racers against each other until the bungee yanks them right back to where they started. The Joust puts contestants on pedestals, who try to knock each other off using over-sized stuffed jousts. The fun center also has obstacle courses, rock walls, and more! 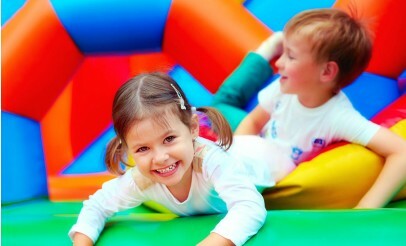 The Bounce House is Utah's premier interactive family fun center. They specialize in wild and wacky inflatable attractions and carnival games. The Bounce House also offers industry-leading customer care and safety is their number one priority for you and your family.